The iGorot Preacher: Rights, Right or Responsiblity? 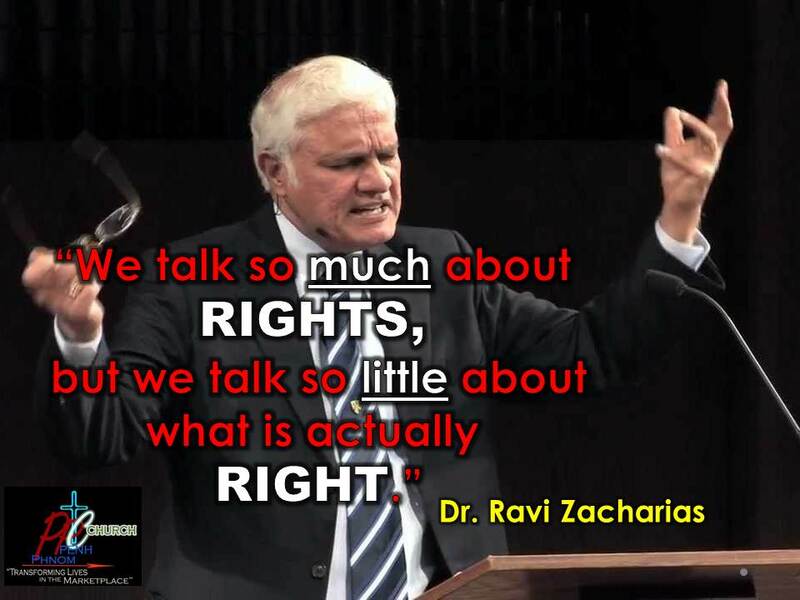 In his Facebook status today, Dr. Ravi Zacharias writes, "We talk so much about rights but we talk so little about what is actually right." Powerful statement in today's rights-obsessed society. 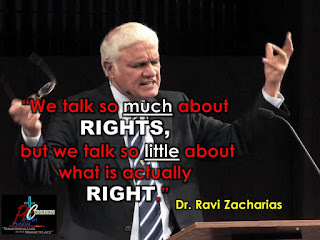 What if we talk about what is right rather than our rights. Because of the abuse of power the tendency to right for our rights is legitimate. Human rights, animal rights, civil rights, legal rights, constitutional and other rights out there are legitimate concern because of abusive individual and people in power. Yet, who give these rights and how do we define what is right? Yet, more importantly, what if we focus on our responsibility rather than our rights and what is right? Sometimes road accidents happen because people insist on their rights and being right. In Cambodia, when motorists keep going even when the light is red causes accident because others know it is their rights to go and they are right. Not only at the stop light one should be careful but also on the right itself. Lots of people drive on the wrong side of the road and when you are on the right lane and others are in the wrong one, the tendency to insist your rights and what is right can cause chaos and havoc. In situation like this, asking the question what is my responsibility is even better than what is my rights and what is right. We maybe be right and it is our rights, but what is our responsibility in such situation?